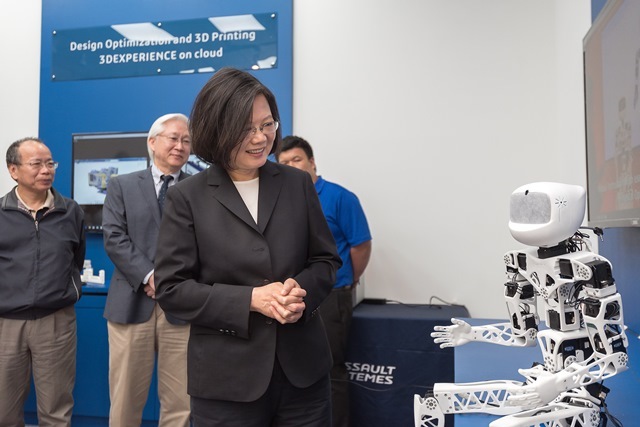 President Tsai Ing-wen gets in some face time with 3-D printed robot Poppy while touring IMPPS May 8 in Taichung City, central Taiwan. President Tsai Ing-wen said May 8 that smart machinery is fast-tracking transformation of traditional manufacturing and spurring industrial development across a broad spectrum of sectors in Taiwan. The global trend of intelligent production combined with a thriving machinery industrial cluster in central Taiwan’s Taichung City and close cooperation between local public and private sectors form the foundation for reaping the rewards from this advanced technology, Tsai said. Short-term dividends include increased productivity for firms in numerous industries and more high-quality jobs, while long-term ones involve Taiwan companies bringing overseas operations home to capitalize on the increasingly robust smart manufacturing environment, Tsai added. The president made the remarks during a visit to state-backed Intelligent Manufacturing Pilot Production Site, Quaser Machine Tools Inc. and Sunspring Metal Corp., all based in Taichung. Her visit is the third in series to local outfits involved in the five-plus-two innovative industries initiative, which covers the biotech and pharmaceuticals, green energy, national defense, smart machinery and Internet of Things sectors, as well as the circular economy and a new paradigm for agricultural development. Tsai said IMPPS is assisting resource-strapped small and medium enterprises utilize the latest smart production technologies in turning out customized products. It is an outstanding example of the government’s commitment to providing Taiwan’s SMEs with the right tools to remain ahead of the competition, she added. Operated by Hsinchu County-headquartered Industrial Technology Research Institute in northern Taiwan under the auspices of the Ministry of Economic Affairs, IMPPS was inaugurated in August 2017 and is playing a front-line role in realizing the government’s national development goals. According to Tsai, IMPPS is one of the many government-supported undertakings responsible for pushing production output of Taiwan’s smart machinery sector over NT$1 trillion (US$33.58 billion) in 2017 and lifting the machine tool industry to fourth in worldwide exports. Given the rapid pace of change in the local smart machinery sector brought about by heightened collaboration among key actors, Tsai said she is bullish on the prospects of Taiwan assuming a global leadership position in the potential-laden industry.